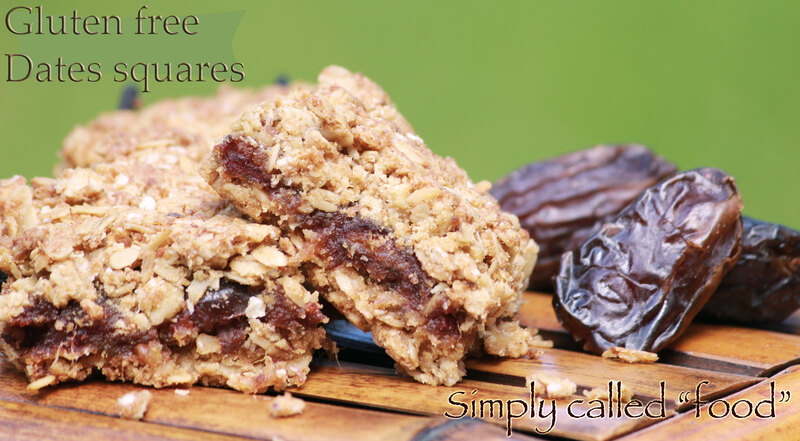 Gluten free dates squares | Simply called "Food"
One thing my family likes is date squares. It is a nice desert or an afternoon snack that doesn’t take long to make but has to be made in advance for cooling time. I was surprised to see that when I when you cooked them, they were not as sweet as they were when raw, so I had to add a bit of sugar, probably because there is water added to them, but it still contains a lot of sugar. For a change today, I made it gluten free to give it a try, and it turned out very well. I also substituted a part of the oat flakes by quinoa flakes. It adds a special flavour to it. Very interesting. In a small pot, put the pitted and chopped dates and cook for about 5 minutes or until it turn into puree, then let them cool. In a small bowl, combine the oatmeal, the quinoa flakes, the rice flour, the tapioca starch, the walnuts and the baking powder. Add the butter to the oat mix. If you have a little mixer, it can be a bit easier. Take an 8″x8″ oven square dish and line it with parchment paper, it is very sticky and can be hard to remove. When you take it out of the oven, let it cool for at least 2 hrs before you remove it from it’s dish or else nothing will hold together. Tags: Dates, Fruit and Vegetable, Gluten free, Oatmeal, Quinoa. Bookmark the permalink.